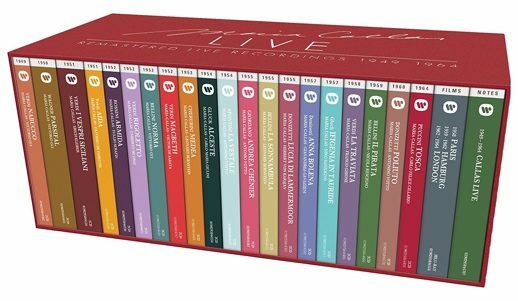 The second half of Warner Classics’ Maria Callas Live Remastered set represents the years 1954 to 1964 in the career of La Divina. A 214-page booklet includes essays new and old, along with many photographs. Documentation for each of the 20 operas includes a complete list of her appearances in that role, with dates, theaters, and colleagues, along with limited information about original sources used for remastering. As in part one, I comment on each performance and its historical importance, with reference to sound quality as far as I am able to compare and/or remember. 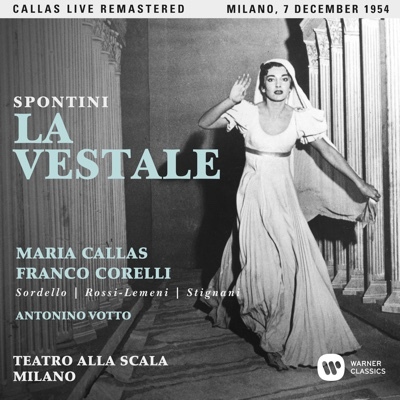 Callas’ first production with Luchino Visconti was Spontini’s La Vestale, which opened the 1954 Scala season. If you only know her studio recording of the arias (I had a brief love affair with “Tu che invoco”), which are perfect for the long line of her sculpted singing, you’ve heard the best of the Norma-precursor score. Franco Corelli’s ardent Licinio and Ebe Stignani’s stentorian Grand Vestal are of interest. 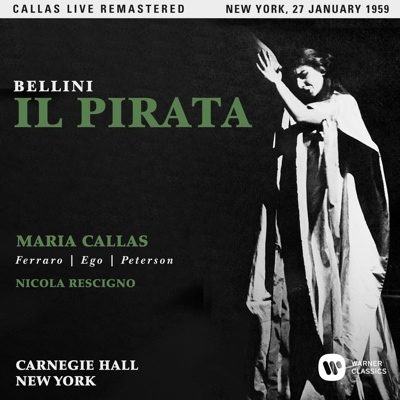 Callas stands up to Nicola Rossi-Lemeni’s thunderous High Priest with both defiant declamation and limpid lyricism to conclude Act Two, but in general the set suffers from distortion in the loud passages. 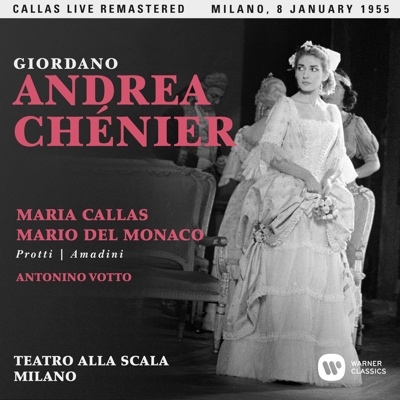 Maddalena has little to do in the tenor-dominated Andrea Chénier, but in this performance (January 8, 1955) Callas’s dramatic contributions—from the frivolous chirping of the spoiled aristocrat of Act One to the passionate cries of a reckless lover—are vocally driven and always strikingly apt, showing no sign that the role was leaned in haste. The multi-colored and poignant aria “La mamma morta” provokes prolonged cheers (some said jeers, as half the house was apparently calling for Tebaldi). Votto digs into the score, the La Scala orchestra sounds superb, and all roles are strongly cast. Mario del Monaco is in stupendous form (Votto eventually gives up trying to continue after “Un dì all’azzurro spazio,” so prolonged and noisy are the bravos), although not as poetic and inspired, perhaps, as Franco Corelli. For the iconic March 5, 1955 Sonnambula—the soprano (with Leonard Bernstein’s guidance) sounding as fragile and lovely as her ballerina looks in another Visconti production—the engineers returned to “an analog source preserved in excellent condition” (about all the detail we ever get in this set) and we are treated to a sparkling, arrestingly immediate capture of this perfect performance. Callas so firmly stamped “Ah! Non credea mirarti” on my psyche that it’s always been a chore to listen to anyone else. Here time stops as the slow tempo creates a truly trance-like state for soprano and audience alike. Taken as a whole, the performance finds her light and confident (“Come per me sereno” and “Sovra il sen”), using a concentrated, internalized sound that seems to hover in the air for the sleepwalking scenes. Cesare Valletti’s adorable and buoyant Elvino is an ideal partner in this recording that never gets old. 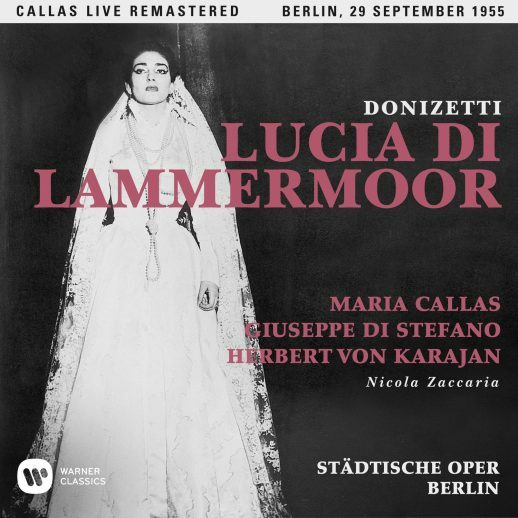 Yet another legendary night in the theater was the September 29, 1955 Lucia di Lamermoor with the La Scala troupe in Berlin under the baton of Herbert von Karajan. Again, the remastering restores a roominess and clarity to the sound, where Karajan provides solidity and import to many of Donizetti’s oom-pa-pa moments, and orchestral introductions, particularly before “Tombe degli avi miei,” are sumptuously played. By mid-century Lucia had become a canary showcase, making Callas’ infusion of drama and complexity into the character of historical importance. She shows Lucia’s full-blooded Scottish side in her no-nonsense delivery of “Regnava,” and prevents the mad scene from becoming a circus. She avoids spooky colors when noting “il fantasma,” and voices “Alfin son tua” with simple tenderness. “Del ciel clemente” is a marvel of pianissimo from everyone (including the audience), and the cadenza features easy legatos, staccatos, fortes, and pianos. Di Stefano is an ideal partner here, having already sung Edgardo to Callas’s first Lucia in 1952 (Mexico City), the next year in Florence and Genoa, and several times in this Scala production. He curses the supposedly unfaithful Lucia with long-breathed lines, and adds rhythmic intensity to the encore of the Sextet. 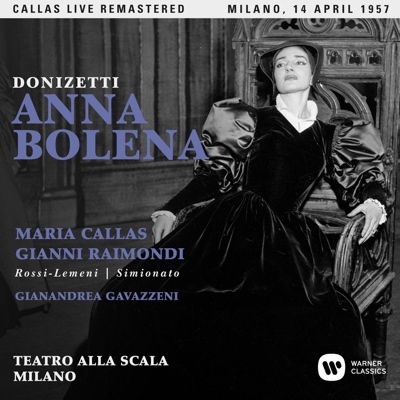 Callas sang Anna Bolena only 12 times, but her exquisite voicing of the title role and her deeply felt characterization—helped by Gianandrea Gavazzeni’s conducting and Luchino Visconti’s production—are well-known to fans. The remastered sound is vivid (the orchestra sounds particularly good), and the presence of Giulietta Simonato adds considerably to the vocal and dramatic heat. The confrontation duet between Anne and Jane Seymour, King Henry’s new love interest, featured on an old HRE LP that I wore out, and the mezzo’s sturdy yet voluptuous singing brings out the best in Callas’s competitiveness, including a joint high C at the duet’s conclusion. I never tire of hearing Callas’s “Giudici? ad Anna?,” with its combination of impetuousness and terror, along with some real-life imperiousness, or her determined broadening of the line before launching the first act finale, “Ah! segnata è la mia sorte,” its quick pace further tightened at the stretto, with the soprano’s top D ringing out thrillingly. The female chorus gets a nice round of applause for their expressive and committed singing to set up the final scene, which is a thing of utter beauty and vocal control from Callas. “Al dolce guidami” in particular, even with its slightly miscalculation at the top of one chromatic line, is delicately laced in stunning sound, perfectly poised in time and space. 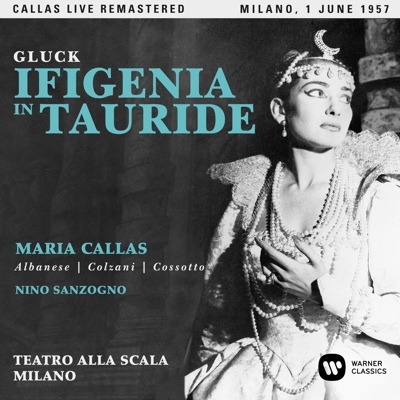 Who will appreciate the 1957 recording of Ifigenia en Tauride from La Scala? If you like Gluck, you won’t enjoy conductor Nino Sanzogno’s leaden and ponderous performance, and Callas lovers will be disappointed with her constricted and compromised sound, as well as the glassy quality retained in the remastering. Fiorenza Cossotto’s brief, last-act Dea ex machina appearance as Diana is of interest, but otherwise the cast is dull and the performance not much more than dutiful. Giulini captured the nobility of Gluck’s writing for the above-mentioned Alceste, but otherwise Gluck and the Italian company proved a poor fit. 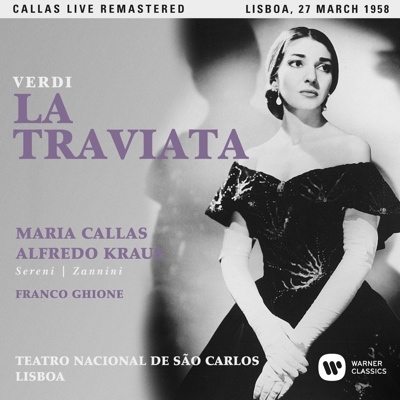 Throughout the fabled Lisbon Traviata Callas’s voice sounds light and bright, the opposite of the unnatural, bottled-up Ifigenia timbre. Here she sounds buoyant and sweet, with the vibrato under control (and she does control it–just listen to her intensify the vibrato as she crescendos “esser amata amando”). “Sempre libera” concludes with a decent, if small, E Flat in alt. But it’s the seasoned interpretation that still stuns the listener, with countless fine touches. The courtesan is ever present, not just in the opening soirée, but in her gracious, laughing reaction to Flora’s party invitation and even on her deathbed, in a lightly flirtatious exchange with the doctor. Alfredo Kraus partners Callas at the highest level of vocalism and dramatic presentation. The exchanges of “Libiamo” sound like an actual conversation, as he sings “amore” vigorously, and she reacts as a coquette. Their interaction is immediately arresting. Kraus begins “Un dì felice” quite slowly, the high notes easy and full, and there is almost a physical caress in the “Croce delizia” section. 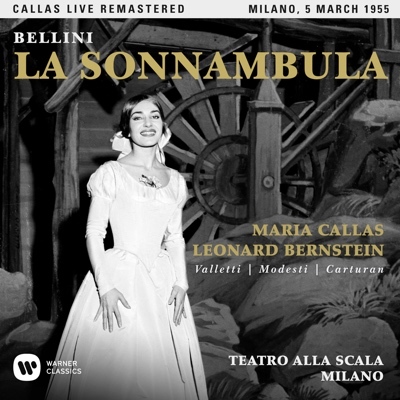 Mario Sereni’s Germont is better than I remembered, though Callas dominates their exchange with her imperious address (“Donna son io”) that quickly turns to terror (“Non sapete quale affetto”). She voices the word “pure” (“Dite alla giovane”) wistfully, but sounds already dead as she awaits instructions (“Imponete”) for dismissing Alfredo. The final act—especially Kraus’s ardent and youthful “Parigi, o cara” and Callas’s long fermata before “Gran Dio! Morir si giovine”—is unsurpassed in pathos, tenderness, and regret. 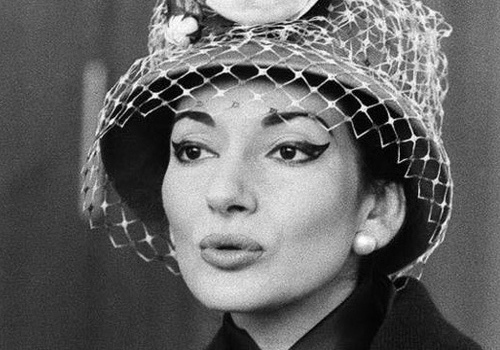 Much of Callas’s bel canto pioneering was done in a vacuum. She was lucky in finding musical partners like Serafin, Karajan and Bernstein, but the soprano’s vocal colleagues were rarely up to her level of technical mastery, style, interpretation, and depth of expression. That is definitely the case in this 1959 Pirata from Carnegie Hall. If any of you were there, please weigh in. The orchestra and chorus sound splendid in the opening storm and shipwreck scene, but Callas begins uncomfortably, using her default stentorian voice and taking high notes a bit wide. She relaxes somewhat for the aria and ensemble that close the first scene (“Sventurata, anch’io deliro”), but much of the singing sounds muzzled, as if the sound were stuck in her cheeks. 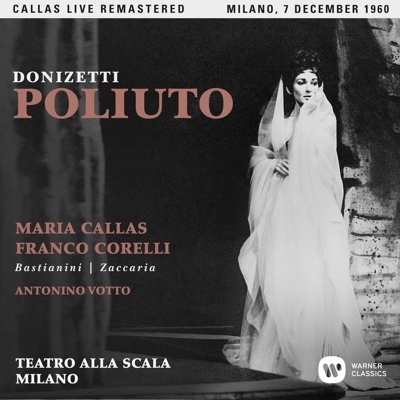 After disagreements with management, Callas returned to La Scala to open the 1960 season with Donizetti’s rarity, Poliuto. Prolonged applause at the soprano’s first appearance must have bolstered her confidence, as did having Franco Corelli play her husband in the larger title role, and Ettore Bastianini as the persecuting Roman ruler Severo. Compared to the relatively recent Myto reissue, we get some additional clarity, particularly in ensembles and orchestral underpinning in the new set, but I see no need to replace that set if you already own it. If you want my copy, or the earlier set from Virtuoso, just let me know. The soprano is in fine form and her command of the style is palpable. She traces the first act’s “Di quai soave lagrime” easily, and brings her customary verve to the short scene-ending “Perchè di stolto giubilo.” Highlights of the Act Two confrontation scene with Severo are Bastianini’s nobly phrased “Il più lieto” and his pleas that Paolina admit her love for him, followed by Callas’s touching “Quest’alma è troppo debole.” Poliuto misinterprets the moment and Corelli’s expressive “Sfolgorò divino raggio” is both moving and thrilling. Zeffirelli’s sensational production, Tito Gobbi’s massively evil Scarpia, and a reportedly gigantic fee were additional draws, and the televised Act Two from this production offers vivid proof of at least the first two. What a pleasure to revisit Gobbi’s work here, growling his first lines, as if he can’t be bothered to “sing,” sneering and twisting the little ornament on “pregar,” (“you pious ladies tread the boards, then come to church to “pray”). He knows just when to sing and when to snarl (“Già, mi dicon venal” is utterly vile), and his musicality is everywhere evident. Once past Renato Cioni’s nasal and bright timbre (perhaps it’s the remastered sound) and clumsy musicianship, he proves a serviceable, even sensitive, Cavaradossi. Callas’s performance is all temperament, quick anger at the blond Madonna, blind rage during the offstage torturing of Mario, contained self-pity during a quiet, swiftly-moving “Vissi d’arte,” and shouting commands at the dying Scarpia. Her screams and sobs at the discovery of Mario’s death never fail to provide chills. The voice has clearly deteriorated, though high notes are passably managed and the score provides plenty of hiding places. What comes through is her utter command of the role and her connection to the drama. 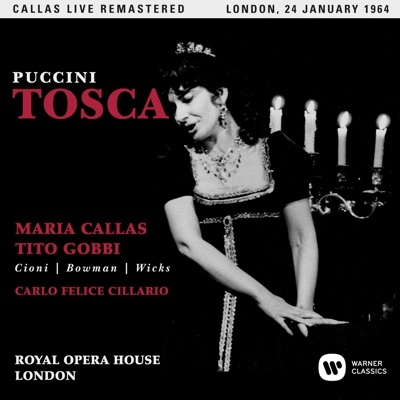 What a short time from the 1949 Nabucco to this 1964 Tosca, but how overflowing with La Divina’s genius, where imagination and instinct contended with technical skill and gripping drama, all in front of us!